(ISJM) Last may I posted about Boston's former Blue Hill Avenue Synagogue, a mighty building saved today as a working church. When I was in Boston again in December for the Association for Jewish studies Annual Meeting I had a chance to visit the most modest (haimish) Vilna Shul on Beacon Hill, a building with which I have a long association, and which has always been one of my favorite American synagogue preservation projects. I want to thank Executive Director Barnet Kessel for taking the time to show me around. The building was saved form the wrecking ball back in the early 1990s - Historic Boston took the lead in that and they called me in as an outside expert (I hardly was at that time) to make the case for saving the building. In the end, through a tortured set of circumstances, Boston did the right thing and kept this old immigrant synagogue on Beacon Hill and gradual over the past two decades a growing community of interest has formed to moved conservation and preservation efforts forward, and to fill with the building with a wide range of activities - education, recreational and religious. The Havurah on the Hill which has met at Vilna since 2002 helps keep the spirit (and spirituality) of Judaism alive at the building, while the proximity to the Boston Freedom Trail has better connected the Jewish immigrant story to the larger Boston historical and social experience. The topography of the Vilna site is unusual, and is one contributing factor to the placement of the main sanctuary on the upper floor (there are others reasons, too). So the downstairs - entered directly form street level, takes you into a relatively low and long space that served as the congregational Beth Midrash, and probably for a mix of social and educational purposes. Today, the Ark wall remains pretty much as it was, and the old paint has been revealed with its decorative motifs (painted vases of flowers flanked the Ark). most of the space is given over to a permanent exhibit about Boston Jewish history. This time around I was especially interested in looking at the painted decoration that has been revealed underneath the sickly beige paint that had long covered the synagogue walls. Gradually, we are understanding the original decoration scheme and there are plans on the books to recreate this in a later phase of restoration. 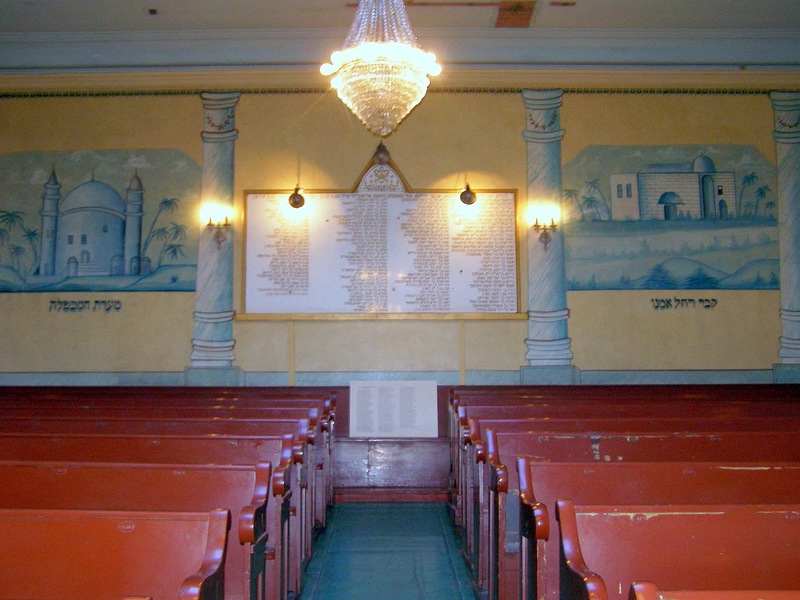 My interest has been revived because my recent experience in Burlington, Vermot visiting the so-called Lost Shul Mural at the former Chai Adam Synagogue. All this decoration was work by and for the immigrant Lithuanian-Jewish community of New England. The Burlington and Boston communities had links - still to be fully explored. Interest is greater now, too, since the publication of of the important 2-volume study of the Synagogues in Lithuania. This detailed study documents all that remains of synagogues within the boundaries of modern Lithuania - and it sadly documents (or suggests) by inference and absence - all that was lost. 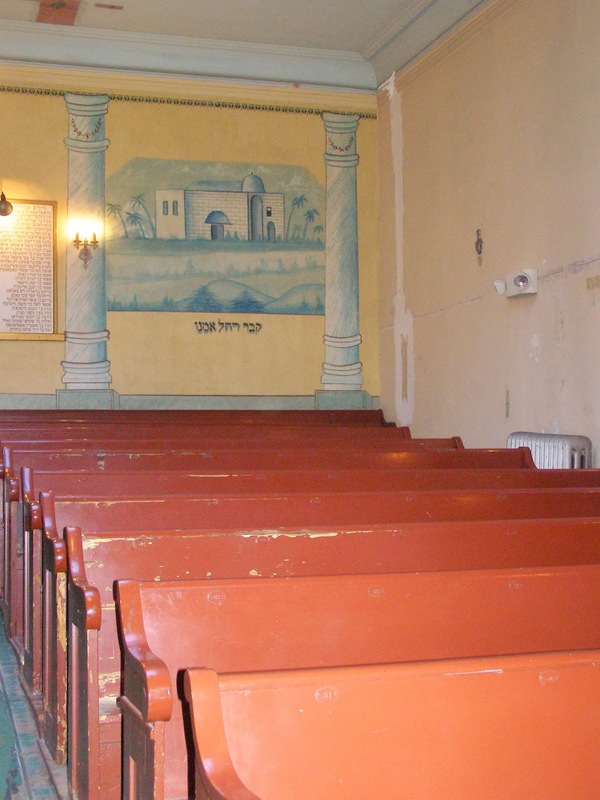 Since there is so little synagogue painting left anywhere in Lithuania, all that we can learn from the work of immigrant communities takes on double value - important for local history, but also to fill in lacunae about synagogue decoration in the "the Old Country." I'm not going to discuss the decoration in any detail here, except to the note the remains of a painted curtain on the walls behind the large wooden Ark, and the two views of Holy Land sites - tombs of the Matriarchs - on the east wall of the women's section. These images of the Cave of Mechpeleh and the Tomb of Rachel are commonly depicted in Eastern European synagogues in the late 19th and early 20th century, and can be found in several immigrant synagogues, too. For the most part they relate to a new-found interest in the topography of the Holy Land due to the increased travel there by pilgrims and tourists - Jewish and Christian - and the growing production of books, prints, postcards and other memorabilia with images of Holy Land sites. More specifically, by1919, the use of these images is usually taken to represent a general interest in Zionism - either religious or political or both. We find these images frequently in Orthodox immigrant synagogues, but hardly ever (ever?) in Reform settings. For the moment, I'll let the photos speak. There is so much to comment on in this synagogue I'd need a little fellowship to write it all up! I hope in the near future that I'll have that chance, or at least the opportunity to speak at length about the history, art and architecture of this little Boston gem. Boston, Mass. Vilna Shul. Sanctuary. This Menorah gives a sense of the building's caretaker's tenacity. Photo: Samuel Gruber 2013.